ChargeAbout’s favourite half day ride! This is not for the pure beginner though as this trail has steep and narrow sections, but for most riders this extra challenge only adds to the fun and with some of Queenstown’s finest food available at the Clubhouse, this adventure is a knockout. This all day adventure is a highlight for so many visitors to Queenstown. 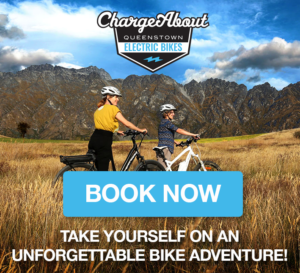 One can ride their ChargeAbout eBike via Arrowtown, or ride the more direct route following the mighty Kawarau river crossing breathtaking bridges along the way. Should you get too excited about trying the vast offerings of wine and food in the area, a shuttle back can be arranged. Ride down beside the mighty Kawarau river to Lake Hayes One of the NZ’s most-photographed lakes. Check out Akarua Wine & Kitchen for coffee – ask ChargeAbout’s staff how to get there. Take yourself on a self-guided electric bike ride to historic Arrowtown via the stunning Dalefield basin. The trails will have you gliding along beside pristine rivers and lakes, over bridges and through the quant surrounds of Millbrook golf course.